= Kyou wa nihongo no denwa no kakakata wo benyou shimashou! = In this lesson, we will study how to make a phone call. = Nihon dewa denwa ni deru toki, denwa wo kakeru toki ni “Moshioshi” to iimasu. = In Japan, they say “Moshimoshi” (means “Hello”) when they call someone or receive a phone call. = How to answer the phone. = Moshimoshi (or hai) , ~ desu. =May I ask who’s calling? = If the person who they want to talk is at home or in the office. = If the person is not at home/in the office. = He/She is not home / in the office at the moment. = She/He is not here at the moment. = Dekakete orimasu. Ima orimasen. to bunshou wo oete mo iidesuga, toki toshite nihongo wa gobi wo owarasenai hou ga yawarakaku kikoemasu. Mata owarasenai koto de aite ni doushitara ii no ka itte morau jikan wo ataeru koto ga arimasu. = You can finish the sentence like “Dekakete orimasu.” or “Ima Orimasen.” but sometimes they don’t finish the sentences to make them sound softer. = Aite kara dengon wo kikitai baai wa. = Ima dewa daredemo keitai denwa wo motte imasuga, chikatetsu ya densha dewa hanbun ijyou no hito ga keitai denwa de ongaku wo kiitari, mail wo yondarishiteiru sugata ga miraremasu. = Everybody has a cell phone nowadays and you can see more than a half of passengers on the subways or trains using a cell phone, listening to music, checking their text mail. This is an old lesson. I made more complete lesson on telephone conversation. 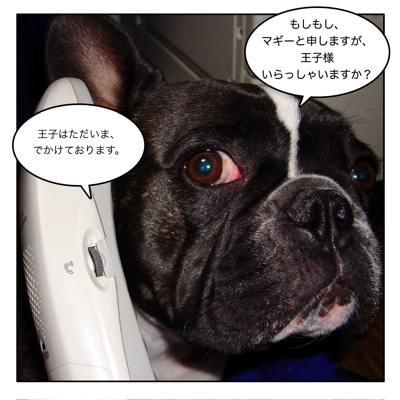 Please go check →New Telephone Japanese. A superior told me 誰としゃべるですか? or something along the lines, or would 話す be a better verb to use? = Dochira ate ni okake deshouka? = Dare ni (donatani) okake desuka? Thanks for this lesson, though I have a question on requesting for a transfer. I made this lesson long time ago and I am thinking about remaking a new one with more information. = Sochira no happyaku juu no heya ni taizai shiteiru (your friend’s name) san ni tsunai de kudasai. = Happyaku juugou shitsu ni tomatte iru ~~ san ni tsunai de kudasai. Could you do a lesson on “texting”? I hear that phone email is used in Japan instead of texting. Here in the U.S., texting is constant for teenagers. I was wondering if a student should say, “tomodachi to keitai meeru o shimasu” to mean “I text with my friends.” Would that sound normal? It is already on the request list. Please wait patiently. There are so many lessons that I want to make. Hi sensei. Is it possible that sensei could explain this sentence for me a little? I feel it says something like: “Also, by not finishing what you want to express, you give the other party time to decide how to continue (make a follow up, how to proceed). As you can see Maggiesensei, I have a little problem with the “dou shitara ii no ka” in this sentence. What does “toki toshite” means sensei? We sometimes give some time to the listeners to tell us what to do by not finishing the sentence. Thus I can give you sometime to decide what to do without asking you to call her back. I got it. I relate these types of sentences to something like: “He is not here now…” with the dots as to allow the other party to finish and unfinished or opened sentence. Sorry for not explaining myself correctly sensei. Is it possible to give some examples of the usage of “ka” in this manner? I think I got your question about the usage of か. か is often used before subordinate clauses. I don’t know “if ” Maggie is coming today. I have to ask “if ” Maggie is coming today. Can you tell me “when” you are coming. I will let you know if I go to school today. I don’t know “what” to do. Can ask Maggie if she likes me? That is exactly what I meant and sensei. As expected of sensei she understands even with poor explanations like mine. Subordinate clauses is the correct name. Thank you sensei for your all your help. Oh, Greeeeeat!! I’m sorry that I didn’t understand your question in the first place. I more or less can guess thanks to the circumstances but I dont know how properly translate it and how they are using -tari suru there. Thank you so much, Maggie is really cute! In that short dialogue, they see someone was calling on Hiro’s cell phone and Hiro wondered it could be Ryoko who is calling. Maybe it(the phone call) could be (from) Ryoko. I understand your explanation and it really suits the circumstances of the conversation but I didnt know this use for -tari suru, it’s usual? I thought -tari suru is for listing activities that doesnt have a continuation or correlation, to mark an action as an example, the repetition of an action or the alternation of states. So if he didnt just use kamo as the coloquial of kamoshirenai is to give that other connotation? And why did you put hyotto shite in brackets? it’s because it’s usually obviated or it’s because it’s an alternative? Usually ~たり is used when you list up a couple of actions. Ex. 寝たり食べたりする = netari tabetari suru = sleeping and eating etc. 〜たりして is a colloquial hypothetical word. The translation is the same as かもしれない (maybe, may, might) but 〜たりしてinvolves more emotion, it would be surprising (fun, strange, great, awful) if ~ . You leave the sentence unfinished. So the listener has to read between the lines. = Ashita wa ame dattari shite. = It might rain tomorrow. = Jitsu wa Maggie kekkon shite itari shite. = It would be surprising if Maggie is married. かも／かもしれない is just a statement. 1) 明日は雨かも（しれない）= I think it may rain tomorrow. Also ~たりして shows more feelings. You add ひょっとして when you emphasizes the presumption/supposition. When you compare a) and b), a) has more possibility than b). Your explanation is pretty easy to understand, thank you so much! Oh! And in this case the tense of suru is always shite, right? You’re welcome! And yes, as for your last question, yes, it’s always tarishite. Im planning to buy gantz strap this month. I have changed my cell phone to iphone. So I can’t have a keitai strap anymore. Hope you can get GANTZ’s strap!! !